Barbecue chicken drumsticks are my favourite summer staple. This spice rub was a last minute solution to, "what do you want on this chicken?" 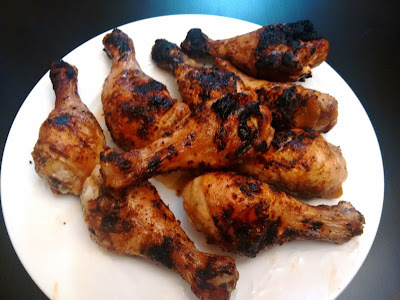 It is easy to throw together and makes just the right amount to spice 16 drumsticks. We served Lemon Pesto pasta salad with these (pesto recipe to come! ), which was a perfect mix of warm spices with tart pesto. Combine spices, sugar and herbs in a small bowl. Sprinkle spice rub evenly over chicken drumsticks. Rub spices in to chicken skin. Turn drumsticks over, and spice opposite side. Barbecue or oven roast drumsticks.